It was very nearly a real-life version of “Snakes on a Plane.” A man was stopped at Cairo’s airport just moments before he boarded a Saudi Arabia-bound plane with carry-on bags filled with live snakes, as well as a few baby crocodiles and chameleons. Security officials became suspicious of the 22-year-old Saudi man’s bags when the X-ray machine at the departure gate gave odd readings. Police said they opened the bags and found a large number of reptiles, including at least one cobra, squirming to escape. The animals were confiscated and turned over to the Cairo Zoo and the man was allowed to board his flight home. Maybe “Warm southern breezes with showers”? The word “hurricane” isn’t heard much these days along Alabama’s beaches. Much like you don’t joke about bombs in an airport, officials along the Alabama gulf coast don’t want to hear the word hurricane used along the state’s white sandy shores. That should fool them. They’ll never guess it’s a hurricane. August 12, 2007 Posted by oldstersview | Dumb Bureaucrats, weather	| Comments Off on Maybe “Warm southern breezes with showers”? 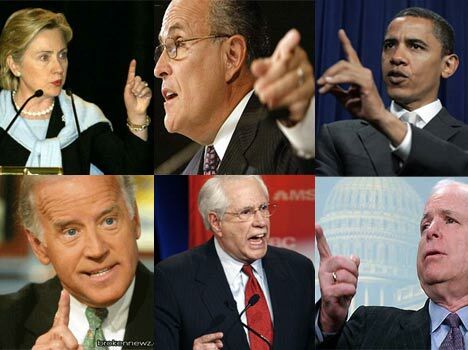 Tips for Presidential Wannabe’s: Remember to always point your finger and scowl. It shows you are serious and really mean what you are saying. Or something like that. How do you steal a three-ton meteorite…and not be noticed? Russian police are combing the northern Siberian city of Krasnoyarsk for a three-ton meteorite that has disappeared from under the nose of its keepers. The giant rock was stolen from the yard of the Tunguska Space Event foundation, whose director said it was the part of meteor that caused a massive explosion in Siberia in 1908, news agency Interfax reported. August 12, 2007 Posted by oldstersview | Crime	| Comments Off on How do you steal a three-ton meteorite…and not be noticed? 7 years? Sounds like a failure to communicate. Steve Graham [Pittsburg, Kansas,] might not be in the doghouse over a dispute with his wife, but as far as his neighbors are concerned, he’s not far from it. For the past seven years, Graham, 55, has been living in his car parked in the backyard of a house he and his wife, La Donna Graham, own. Graham said the two have “been having troubles” since 1999 and that he’s been out of the house since about 2000. His wife still lives in the home. August 12, 2007 Posted by oldstersview | People, Strange	| Comments Off on 7 years? Sounds like a failure to communicate.